Retail garden centers, take note: edible landscaping is one of the hot trends for 2016. Almost every commodity experiences trends, whether it is the food we eat, vitamins we take, clothes we wear, cars we buy and so on. 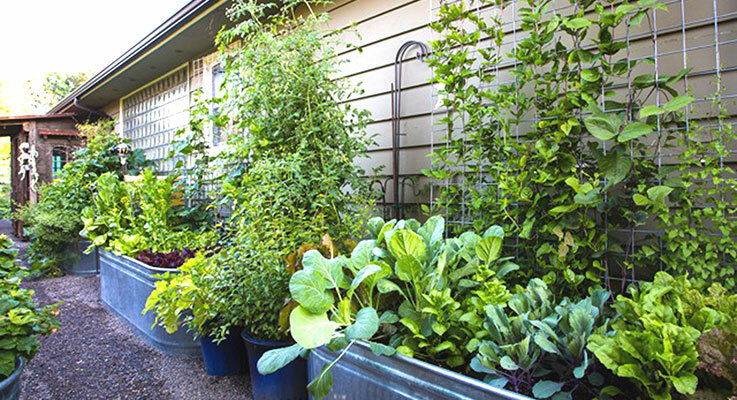 In gardening, there are changes from year to year in the types of plants that are bought, the amendments and spraying practices used, and the ways we garden — in containers, raised beds, on a deck or balcony — and the list goes on. Clematis is a good example of a plant genus that has become trendy and has proliferated in home gardens over the last 10–15 years. In the past, many older Portland homes would have a large summer-blooming Clematis, and garden centers would have carried several different cultivars. Today, the selection of Clematis offered to home gardeners is far vaster than it was even several years ago. Now there are sufficient varieties such that a gardener can have Clematis in bloom almost year round. Another more recent plant trend is dwarf conifers, which were almost unheard of several years ago. Now, a great array of them can be found at many local garden centers. Among the gardening trends I’ve been seeing and hearing about lately, however, edible landscaping (aka “foodscaping”) leads the pack. I have seen more and more home gardeners planting vegetable gardens and mixing edible plants into what had traditionally been an ornamental flower garden, and gardeners have become quite creative in their planting of vegetables, even in relatively small spaces. In addition to the traditional summer vegetable garden, gardeners are stretching the season by planting earlier and later seasonal varieties, and by using structures to protect the plants against the elements. For example, during last summer’s Portland Garden Conservancy Tour, I visited the garden of Gordon and Nancy Prewitt. I was impressed with the immense, prolific summer vegetable garden they had. Talking with them about gardening, I learned they also maintained an all-season vegetable garden, which allows them to extend the growing season. This past January, Gordon was harvesting Brussels sprouts, kale, bok choy, carrots, parsnips and lettuce. The Prewitts also do a great job of incorporating edible plants into ornamental beds. The planting of blueberries in their garden is a prime example of how ornamentals and edibles can co-exist. Blueberry plants are much more than shrubs with edible berries. The creamy white flowers in the spring are quite showy, and in the fall, many blueberry plants provide an outstanding range of yellow to orange fall colors. The Prewitts had planted different cultivars to extend the picking season. Another example is the southwest Portland garden of Craig Quirk and Larry Neill, which features an assortment of ornamental plants and garden art. It has been featured in many garden magazines and is better known as an ornamental garden than a garden with edibles. But that has changed over the past couple years; now the garden has a specific area devoted to vegetables. The area along one side of their house was originally used exclusively as a pathway to get from the front to the back. Even though the space is quite narrow, it receives plenty of sunlight. Wanting to utilize as much of the space as possible, they purchased three water troughs, put holes in the bottom for drainage and filled them with a premium soil mix. During summer, these troughs are packed full of vegetable plants: tomatoes, carrots, lettuce, squash, cucumber and more. They erected a trellis at the rear of the troughs to grow climbing vegetables such as pole beans to prevent them from blocking the sunlight needed by the other vegetables. In addition, they situated a beehive between two of the troughs, and it has proven to be a very efficient producer of honey. A third example is the garden of Harry Olson in Salem. To make his standard city lot as efficient as possible for edibles, Harry built a series of raised beds primarily for tomatoes and peppers. To expand his palette of fruits, Harry built a series of wire frames to espalier fruit trees. He has been very successful at growing apples, pears, plums and peaches on these wires. When planting fruit trees, it’s important to check whether the variety needs a pollinator and if it does, plant one. I believe that the edible gardening trend can be immensely important to retail garden centers. As home gardeners visit other gardens, read articles about the resurgence of planting edibles, and hear and see information on the radio and television, many of them are going to want to try their hand at foodscaping in their own garden. While general interest in new trends is hardly ever in short supply, the element that is often missing is practical information. What better place to get it than the local garden center? Make sure your sales staff is ready to answer questions and offer suggestions about edible landscaping. Tie-in sales are limitless, including tools, soils, fertilizers, garden twine and ties, stakes, seeds, starter plants, starter trays, mulches, row covers, garden hoses, sprinklers, protective netting, mason bee starter kits and the list goes on. Displays of pots and other containers planted with edibles can demonstrate the possibilities for a deck or patio garden. Gardening is not complex, and new gardeners need to have that perception. Show customers how simple edible gardening can be, and be prepared for customers who want to buy the containers on display. Don’t tell them no!